Mission Repair Express – Indianapolis – COMING SOON! I just posted a blog that I’ll be opening our first Mission Repair Express in Colorado in a few short weeks…the location is perfect, the site is staffed and I’m ready to have a Grand Opening soon. Now that we’re “locked and loaded” in Lakewood, Colorado (a suburb of Denver), we signed an agreement to open a new site in Indianapolis, Indiana as well! During the holidays, Indianapolis hosts a slew of fun Holiday themed events including the “Devour Downtown Winterfest”, the “Festival of Trees”, the “Circle of Lights” and the “Christmas at the Zoo”. This is an amazing city that I’ve spent some time in. In fact, Dan McQuaid, a former Tackle for the Indianapolis Colts (A friend from a “lifetime” ago) retired from the Colts and moved from Indianapolis to Sacramento. I was his moving buddy as we filled up his Ford Bronco and made the trek from Indiana to California in the dead of Winter. This was back in 1990; I was freshly out of High School, and Dan was freshly into retirement. The best part about the trip was that I got to spend some time in the “underbelly” of the Colt’s stadium. Hang out where the players hung out…see the lockers, use the workout room, and see where the future “Hall of Fame” Quarterback Peyton Manning would eventually start playing in 1998. So, with my personal experiences aside, the more exciting part of this blog is that we will be opening in Indianapolis soon. We are scouting locations, but have a lot of the parts in motion and will be deciding on an address shortly. Once we do, just like our new Denver site, it won’t take long for us to move in. It’s interesting; we receive a significant amount of repairs mailed in from the Indianapolis region. More so than Colorado, so we will be sharing this info with our Indiana customers because we’ll be “locals”. Thanks for everyone’s patronage and we look forward to seeing you soon! Thanks for reading…we’re dedicated to making sure that Mission Repair provides the best possible services and rest assured there’s a master plan that goes along with all of our new Mission Repair Express locations, and the competition won’t be able to keep up! Join Us For The Unveiling of the New Downtown Mission & Save 10%! Tomorrow is the BIG unveiling of the New Downtown Mission. If you live in the Kansas City area you are probably aware of the construction that has been taking place on Johnson Drive for the past few months. The project is COMPLETE and The City of Mission is breaking the barricades at 9:00 am tomorrow morning. Local business are ready to celebrate and we encourage you to shop local this weekend in Downtown Mission. The big event begins right outside of Mission Repair Express at Johnson Drive and Maple and we would love to see you there tomorrow morning! In celebration, we are offering 10% off to all walk-in customers at our Mission location Friday – Sunday. There is NO COUPON necessary, just let your customer service representative know you want to take advantage of this sale! 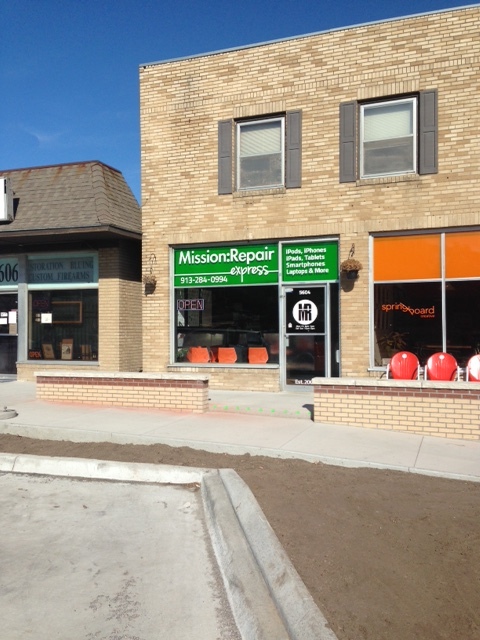 We have had a lot of construction at Mission Repair Express the past few months but it is complete and we are excited. This 10% off is for any new walk-in orders GOOD AT OUR MISSION REPAIR EXPRESS LOCATION ONLY! Offer cannot be combined with any other coupon and expires Sunday 11/16 at midnight. There’s no better time to visit our Mission location and save a bundle on your iPhone, iPad, Tablet or Computer repair. Mission repair Express- the construction is almost complete! We have been through an immense construction project at our Mission Repair Express location in Mission Kansas all summer- and the end is in sight. The dirt will be filled with grass, tress, and plantings hopefully by Friday, I can’t wait to see the finished results! Directly across the street is a park that has been fulled sodded and ready for long walks, joggers and picnic goers. The entire downtown run looks completely different and the City of Mission is ready. On Friday morning there will be a parade and the City is handing out “swag bags” (look for your Mission Repair Coupon Inside!) and we will be giving discounts all weekend long. We hope to see you there! I’ll be posting some pics of the unveiling Friday! The best marketing in the world. Read it and think about it. 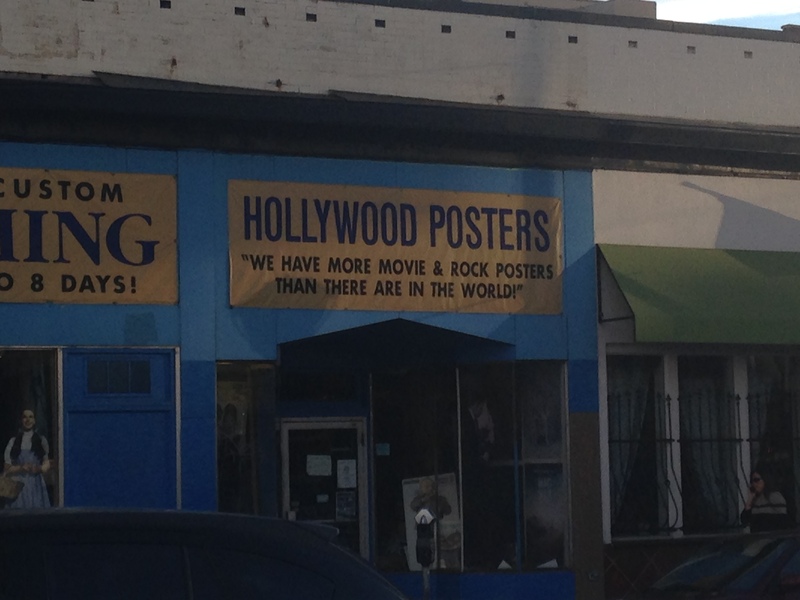 At first I laughed it off as just a ridiculously bad way to convey that they had a lot of posters. But I found myself thinking about the sign, the message (clearly they must have a lot of posters in there) and it stuck with me. I do a lot of marketing every day. I think about my messages. Maybe it’s time for a little guerrilla marketing at Mission Repair. To be honest, business is going quite well, but it never hurts to mix it up a little. “Mission Repair, we’ve serviced more iPhones than there are in the world”. Or something to that effect. Any ideas for me? Until it appears in a vision, I’ll talk to you again soon. Hello everyone- we sent out a newsletter yesterday to our local region, and if you missed it, we’ve got the special right here for you. We are offering 20% off on any repair now through Friday at closing time (which is 7:00 pm, CST) if you visit our location in Mission, Kansas. The address is 5604 Johnson Drive, Mission Kansas 66202, and you can get directions here. It’s a customer appreciation sale and all you need to do to get this special pricing is print out a copy of this blog (or the newsletter if you’re a subscriber), walk in to our Mission Repair Express location now through tomorrow evening at 7:00pm, show your customer service representative this special and place your repair order to receive the 20% discount.